Otavalo is located in Imbabura, Ecuador. It is a popular attraction for people visiting Ecuador. The make-up the city is of indigenous, mestizos and of European descent people. 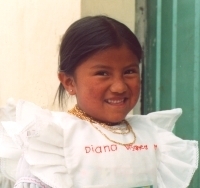 There are approximately 40,000 native otavaleños, and most live in the surrounding villages. Most native otavaleños are master weavers and great businessman. One can appreciate this art when visiting "la Plaza de los Ponchos," where you will find ponchos, hand made blankets and sweaters, "Panama Hats," (an Ecuadorian product), a variety of hand made jewelry..... Otavaleños have great traditional hard working ethics and have popularized their work all over the world. One can find otavaleños selling their products at fairs around the world, from New York to London to Munich. Despite the almost criminal way that the Ecuadorian government has treated its native people, otavaleños have shown the greatness of Ecuador.